Published 3 months ago. About a 9 minute read. The work to clean up our plastic mess continues with new initiatives from more major brands. Today, the Lush shop at 10 Market Street in Manchester opened its doors again after being renovated into the first plastic packaging-free cosmetics shop in the country. Lush’s newest Naked shop — which follows the success of the company’s first Naked shops in Milan and Berlin — offers an abundance of plastic-free alternatives to your favorite cosmetics — from Lush classics such as solid shampoo bars and soaps, to new naked skincare innovations. Naked products make up almost 50 percent of Lush's core range. Since Lush’s first naked shops opened in late 2018, solid shampoo bars have been their most popular products — with almost 8,000 sold. That’s up to 616,880 hair washes that haven’t come from plastic bottles! Lush has been working on reducing packaging for years; the company says the new Naked shop is an exploration into pushing things further. 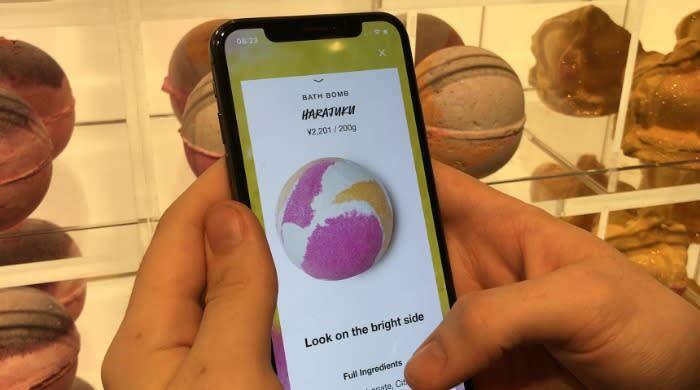 And, rather than scanning labels for information, visitors to the shop will instead be able to scan products directly using the recently launched #LushLabs app, replacing packaging with a digital solution. **Lush Lens **is an in-development experiment feature that enables Lush to reduce their impact on the environment by using the phone's camera and Machine Learning to recognise products and give detailed ingredient information and ‘how to use’ demonstrations via the app. This week, Marks & Spencer put a dent in the amount of its own plastic by trialing over 90 lines of loose fruit and vegetables completely free of plastic packaging at its Tolworth store. To support the trial, M&S has introduced trained greengrocers, who will be on hand to offer customers advice as they select from two plastic-free aisles of fruit and vegetables. The range not only includes hard fruit and veg such as potatoes and bananas, but also more perishable/squishable items such as tomatoes and berries, which will be sold in compostable baskets. In addition to helping customers pick and weigh their products, the greengrocers will provide tips on how best to preserve fresh produce and prevent food waste at home, as M&S has removed “best before” date labels from fresh produce as part of the trial. The three-month trial at Tolworth will be the springboard for M&S’s long-term plastic-reduction strategy, providing insights and customer feedback for an effective approach across all stores. Meanwhile, Nestlé announced a series of specific actions towards meeting its April 2018 commitment to make 100 percent of its packaging recyclable or reusable by 2025, with a particular focus on avoiding plastic waste. CEO Mark Schneider said: "Our broader vision and action plan outline our commitment and specific approach to addressing the plastics packaging waste issue. While we are committed to pursuing recycling options where feasible, we know that 100 percent recyclability is not enough to successfully tackle the plastics waste crisis. We need to push the boundaries and do more. We are determined to look at every option to solve this complex challenge and embrace multiple solutions that can have an impact now. We believe in the value of recyclable and compostable, paper-based materials and biodegradable polymers, in particular where recycling infrastructure does not exist. “Collective action is vital, which is why we are also engaging consumers, business partners and all of our Nestlé colleagues to play their part. You can count on us to be a leader in this space!" Addressing the multifaceted issue of plastic pollution requires a holistic view and a well-orchestrated effort. To this end, Nestlé announced tangible steps to pioneer alternative materials, shape a waste-free future and drive behavior change. In December 2018, Nestlé announced the creation of its Institute of Packaging Sciences (IPS) to evaluate and develop various sustainable packaging materials and to collaborate with industrial partners to develop new packaging materials and solutions. Starting in February 2019, Nestlé will begin to eliminate all plastic straws from its products, using alternative materials such as paper, as well as innovative designs to reduce littering. Nestlé will start rolling out paper packaging for Nesquik in the first quarter of 2019 and for the Yes! snack bar in the second half of 2019. Smarties will start rolling out plastic-free packaging in 2019 and Milo will introduce paper-based pouches in 2020. Nestlé Waters will increase the recycled PET content in its bottles to 35 percent by 2025 at the global level and will reach 50 percent in the United States, with a specific focus on its Poland Spring brand; and will increase recycled PET content for its European brands Acqua Panna*,* Buxton,* Henniez and Levissima to 50 percent by 2025. Successful recycling requires adequate infrastructure, which is not always in place. The IPS is exploring new paper-based materials and biodegradable/compostable polymers that are also recyclable, among other alternatives. This could become a valuable option in places where recycling infrastructure does not yet exist and will not be available for some time. Nestlé is also collaborating with external partners. The company has formed a global partnership with Danimer Scientific — a pioneer in creating more sustainable and more natural ways to make plastic products —to develop a marine biodegradable and recyclable water bottle. Nestlé also initiated a collaboration with PureCycle Technologies to produce food-grade recycled polypropylene — a polymer commonly used for packing food in trays, tubs, cups and bottles. PureCycle is commercializing groundbreaking recycling technologies that can remove color, odor and contaminants from plastic waste feedstock in order to transform it into virgin-like resin. Plastic waste in the ocean poses a particular threat to Indonesia as well as other Southeast Asian countries. Nestlé has therefore become the first food company to partner with Project STOP — a leading initiative to prevent the leakage of plastic into the ocean by developing partnerships with cities and governments in Southeast Asia — which was launched in Indonesia in 2017. Project STOP is creating sustainable, circular and low-cost waste systems that capture as much value from waste as possible. It supports the many existing local initiatives and informal waste pickers in Indonesia’s coastal areas. Over the coming months, Nestlé will take the learnings from this project to other countries where we operate, in an effort to deliver ‘plastic neutrality’ in those markets. All 4,200 Nestlé facilities worldwide are committed to eliminating single-use plastic items that cannot be recycled. These items will be replaced by materials that can easily be recycled or reused.